Henley was an English poet, critic and editor. At the age of 12 he lost his left leg below the knee due to tuberculosis but that didn't stop him from moving to London to become a journalist at the age of 18. However, his right leg also became diseased, so for the next eight years was in and out of hospital to treat his leg. 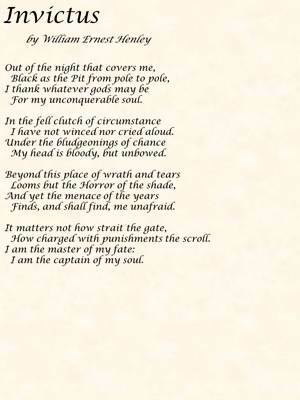 His most remembered poem, "Invictus", was written shortly after his right foot was amputated. Henley was the inspiration for the character Long John Silver by his friend Robert Louis Stevenson who wrote Treasure Island.